Polka Galerie is pleased to announce a cycle of three exhibitions (September 2012-January 2013) dedicated to Daido Moriyama’s œuvres (born in Japan in 1938). Our ambition is to apprehend multiple aspects of the artist’s work: his practice of street photography and wanderings, installations and diverse techniques. 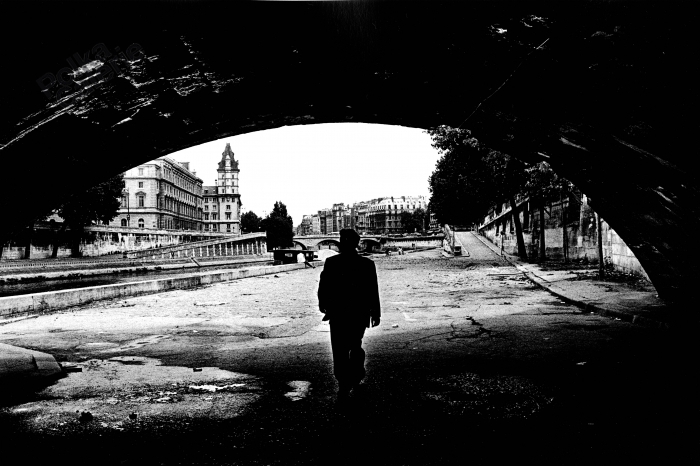 Form 1988 to 1990, Daido Moriyama lived in Paris first on rue Mouffetard, then on rue du Cherche-midi. In 2009, photographs from his stay were published, almost confidentially, in the “Visions of Japan” collection curated by Japanese editor Korinsha. Polka Galerie is proud to present a selection of thirty prints from this series never exhibited before. Daido Moriyama harps on Modern occidental artists like Robert Doisneau’s famous photograph in front of the “Hôtel de ville” and Claude Monet’s “Gare Saint-Lazare”. But above all, it is Eugene Atget and his “Photographe de Paris”’s influence that looms over his work. On Moriyama’s images, one can find either narrow streets photographed day and night and cramped with often-empty shops, or beggars lost in the city’s architecture. «Paris» also shows Daido Moriyama’s almost obsessive love of graphic games and shop windows. By the end of the seventies, Daido Moriyama had exchanged several conversations with Takuma Nakahira, co-founder of the “Provoke” magazine and author of a visionary essay on Eugene Atget’s work “Looking at the city, or the Look from the City” (1973). The “Paris” series was published in Japan in “Visions of Japan” collection, Korinsha, Tokyo, Japan, 1999.